Whether God is using Kristin to raise children or the children to grow Kristin, He is present in every moment and every page. This warm, real, and insightful devotional celebrates the journey of growth mothers take with their children. Since their births, Kristin realized she has “discovered more about myself and my God in the pursuit of discovering my children.” Each entry in this 365-day devotional contains a Bible verse and a personal reflection from Kristin. It is on this intimate, daily walk that mothers can gain the courage to rely on God and emerge as a better woman. I did not do this for 365 days in a row because I wanted to get this reviewed in a reasonable time. It has encouraging entries and thoughtful entries. It is a great daily devotional even for the busiest moms. The entries are short (1 page long) but each entry has great information. Kristin writes on some personal thoughts and experiences while incorporating a bible verse each day and Christian idea/them. I got a lot out of the entries. Like anything, there will be some entries that won’t necessarily speak to you, and you may not get much out of what she wrote. Just be encouraged that someone is getting something out of the message for the day and maybe tomorrow is the message that really speaks to your heart. 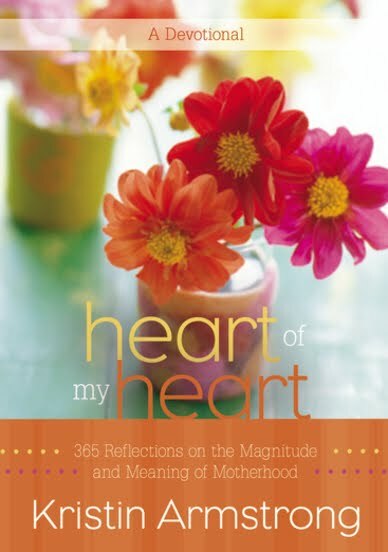 I encourage all you Christian mothers out there to buy this devotion and do it daily.Buy It: You can buy Heart of my Heart by Kristin Armstrong for $16.99. Disclaimer: I received this free of charge. I was in no way compensated for this post. Everything written is my own thoughts and feelings. Thank you!